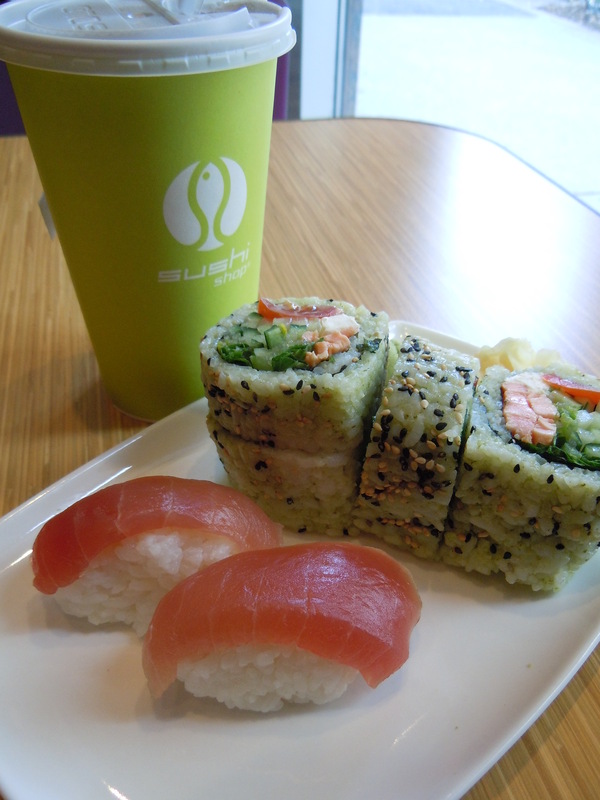 Meet the Tokyo sumomaki roll, rolling out on The Sushi Shop’s red carpet of new sushi rolls for 2011! Since they introduced their new menu with the new additions back in the spring, I’ve been able to try two out of the four new ones: the Tempura Syake Hosomaki (tempura mixed with salmon) and this one, the Tokyo sumomaki. One of four new sushi roll additions to the 2011 menu, the Tokyo is THE roll for those who like simplicity and who love both salmon and tuna sushi but can’t decide which one of the two they love more. And if you have the sneaking suspicion that I am actually describing myself, you are right. Sigh. 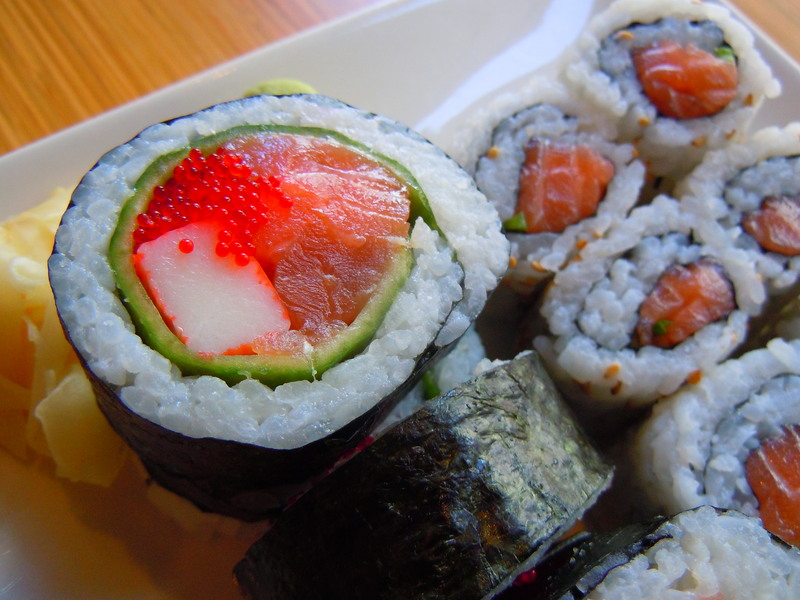 Some days I think my heart will forever belong to salmon while I am reminded on other days that the thought of spicy tuna rolls and tuna nigiri make me salivate. 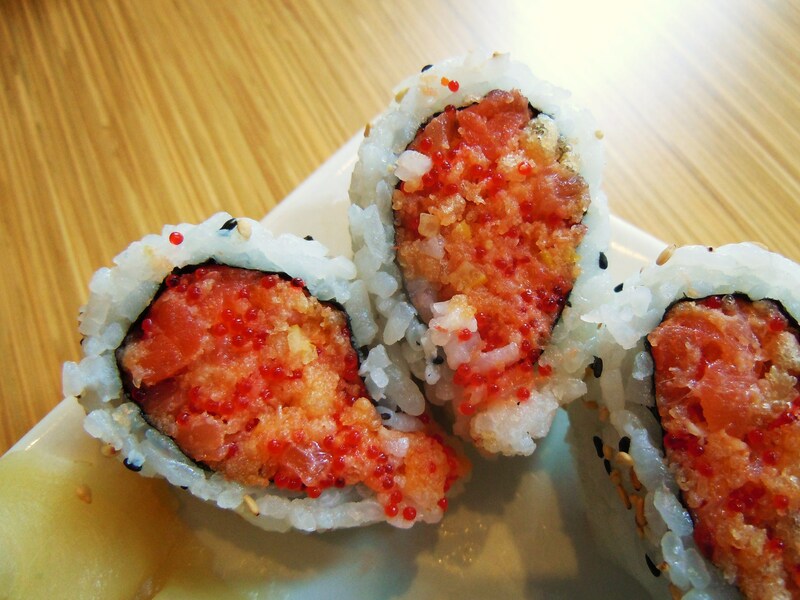 You get the best of both worlds with this roll because the Tokyo rolls are stuffed with fresh chunks of salmon, tuna, crabstick, and red masago with a ring of cucumber hugging everything all snuggly together. 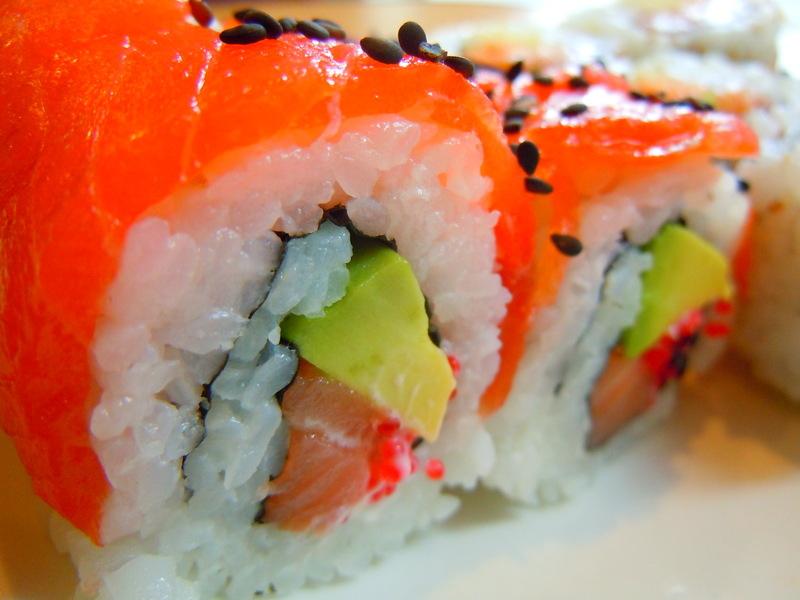 Just think, as a sushi lover you’ll never have to choose between salmon and tuna again! And oddly enough, the ingredients themselves are as basic and stripped down as it can get when it comes to sushi rolls, yet the rolls come together really beautifully (look how pretty they are!) and deliciously. The ring of cucumber leads me to envision the Japanese flag (the red against the white with the circular emphasis) while the meaty texture and flavour of the salmon, tuna, and crab contrast nicely with the crunchy freshness of the cucumber. It’s a simple roll that executes really well. During this particular Sushi Shop lunch, I discovered (or rather, realized) a must-have: a side of spicy sushi mayo. I love sauce, I love dip, and holy mother of pearl is this sauce ever freakin’ delicious. The side of spicy mayo as an add-on has been on the menu for eons and I honestly can’t explain why I didn’t try it until that particular day. As a lover of sauce and dip, I even put myself to shame for that brain fart. For the generous helping of sauce they give you, it is SO worth it. There isn’t much else $0.50 can buy you these days, so if you love spicy stuff and dipping and dunking like I do, I suggest you get some and inhale it. You will wiggle with happiness. The end. 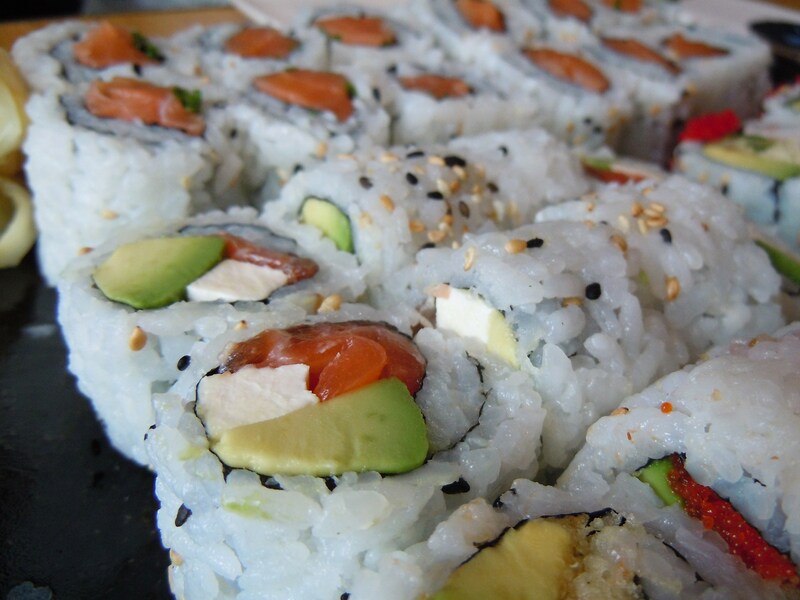 The Sushi Shop is located at the intersection of Yonge and Carlton St. (3 Carlton St.), with 2 other take-out locations serving the downtown core, one being in the GO train station concourse and the other near Maple Leaf Square at 25 York St (closed Saturday and Sunday). According to Google map, there is also a location on Bloor St. E at 175 Bloor St.E (Saturday and Sunday closed as well). 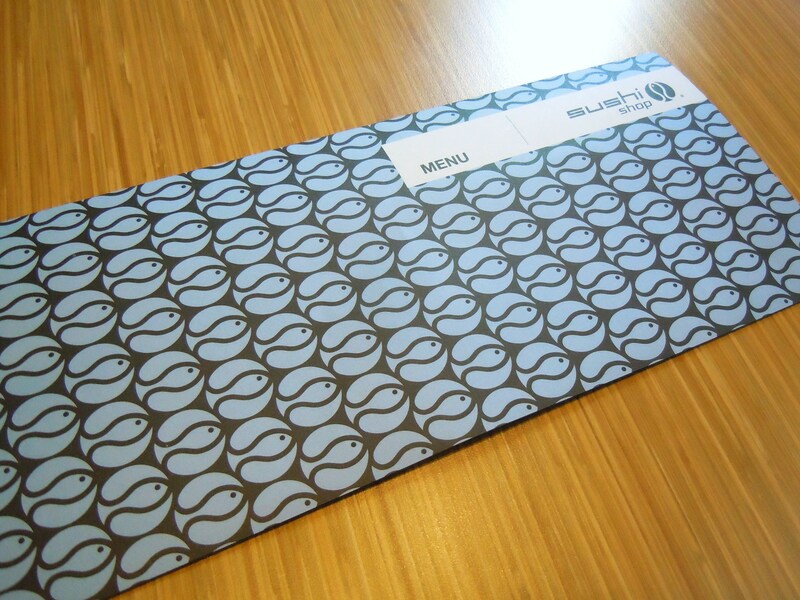 For more info on their menu, promos, and shop, check out their official website here. 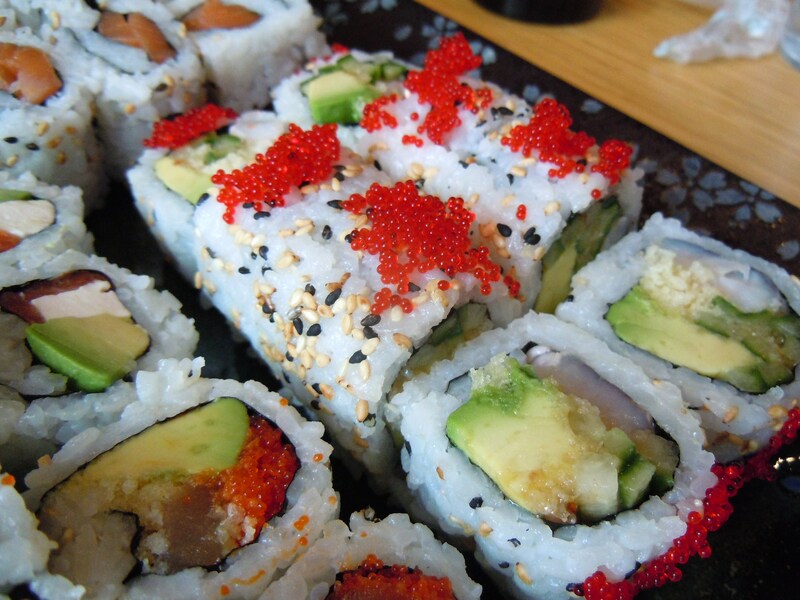 How exciting is it when your favourite sushi place introduces new menu items? VERY! 😀 You all know how much I love The Sushi Shop and how I can eat their maki rolls till the sun comes up. One of the many reasons why I enjoy eating here so much has to do with their consistent way of churning out new rolls and creative combinations. Now that’s not to say that old stand-bys aren’t great; on the contrary, discontinuing best sellers and favourites is a big no-no for diehards like myself who would most likely cry or whimper about it on the subway ride back home. It’s really fun though to open up the menu to discover that there are FOUR new kinds of rolls you’ve never seen and tried before! So long as they keep doing what they do best, it’s all in good fun and it keeps things fresh. 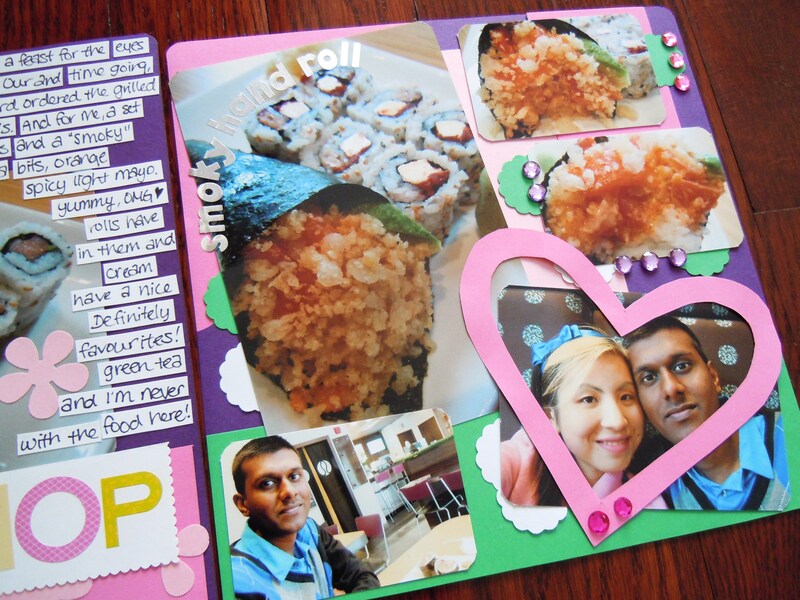 I loved the way they incorporated Valentine’s Day into their sushi by creating their Sweetheart sushi rolls in the shape of two halves of a heart put together. It was just too cute and so creative and, lucky for me, they decided to add it to their permanent menu of rolls alongside their newest additions. 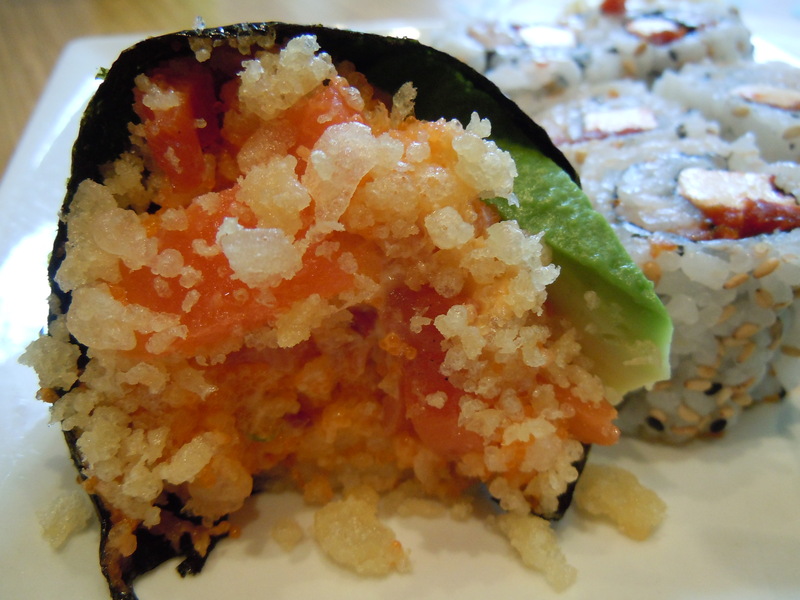 4) the Tempura Syake Hosomaki (tempura mixed with salmon). Given how I love salmon sushi the way Homer chugs down beer and scarfs down donuts, it made perfect logical sense to give the Tempura Syake a whirl, especially considering how crazy I am about different textures with my sushi. I really enjoy Sushi on Bloor’s crunchy rolls (salmon with tempura bits and avocado) and I couldn’t imagine not being totally in love with Sushi Shop’s interpretation. 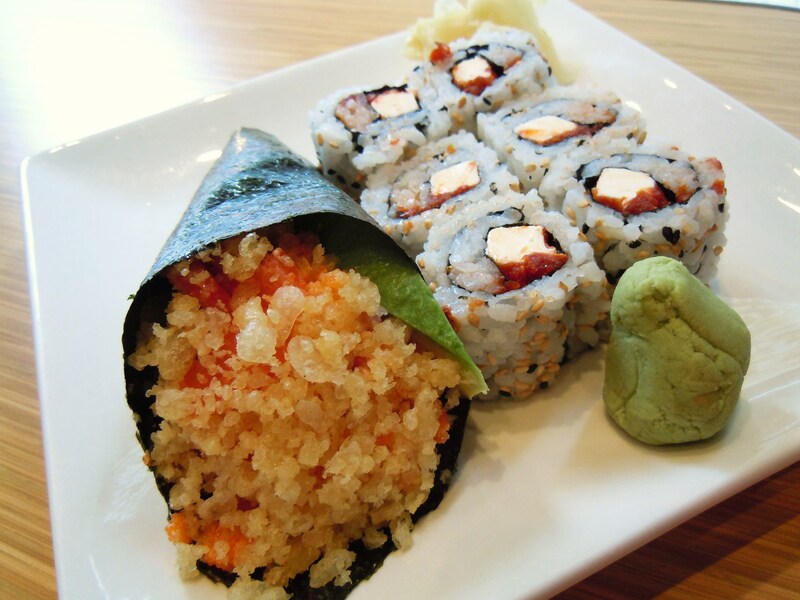 The tempura in their rolls is just different and amazing. I don’t know if it’s because the bits seem bigger and therefore crunchier, or if it’s because of the spicy mayo they use with the salmon and tempura, but the combination is SO soft and flavourful. Even though my boyfriend and I would agree that that their tempura shrimp appetizer isn’t their strong suit, they nail it using tempura in their rolls. Come to think of it, the tempura shrimp appetizer seems to be the only blip in their repertoire and not because it tastes bad, but only because they don’t measure up to other sushi places in the city in terms of size and portion and the like. Otherwise, their tartare is fabulous, their Fuji Bowls are delicious (my boyfriend loved his and reported back to me, ha), and their rolls are out of this world. And to make it even more perfect? Ordering the Twin Salmon maki (rolls with salmon, avocado, red masago, and light mayo draped with the most mouthwatering smoked salmon with black sesame seeds) with these new Tempura Syake rolls seals the salmon lover’s deal. 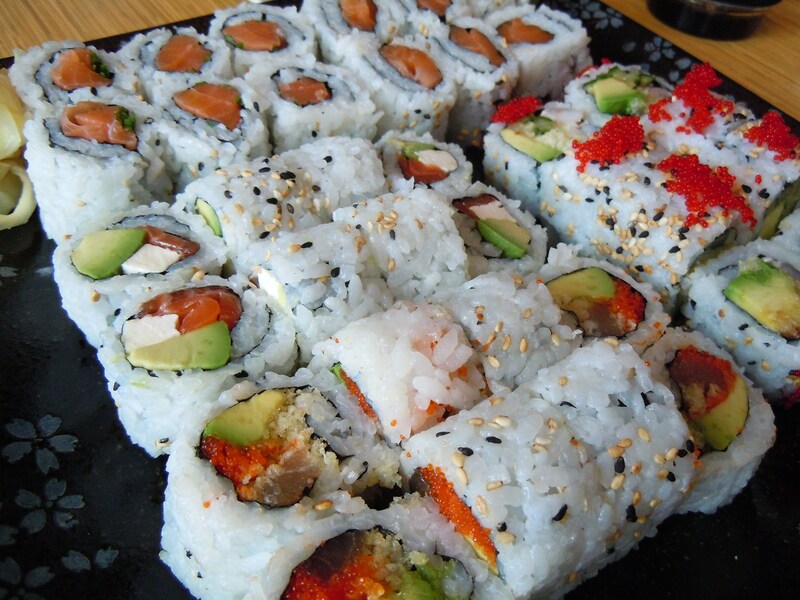 Oh sushi, how I’ve missed you. Well, blogging about you anyway because I actually ate some last week! These pictures were taken on a very special day during the first week of March. If you’ve been reading and following my blog, I know you’re probably thinking that sushi is very commonplace in my foodie world and EVERY sushi adventure is awesome for me. And that’s true, but this meal was different because I enjoyed it with my mum and my brother during my brother’s spring break. Let it be known that my younger brother and I, as close as we are, are very different in personality. He’s four and a half years my junior, he’s one of my best friends in life, and we couldn’t be more different. I am the chatty, bubbly, independent artsy fartsy one who loves going out. He is the shy, quiet homebody who loves the comfort of home. He looooves it when we go out as a family, but unlike me, he would never venture out on his own for the sake of it. I, on the other hand, will arbitrarily pick a subway station off the map, get off, and walk around without knowing what the heck is around the area. So when I told him that I wanted to take him out for a day on the town during his spring break, he was mega excited. 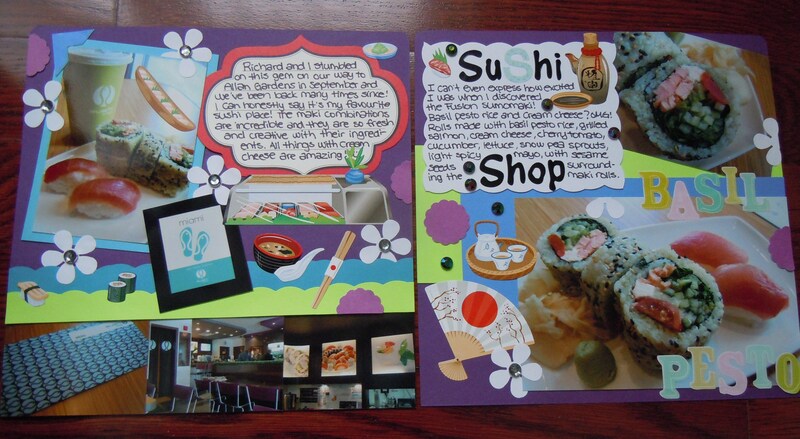 I took him and my mum to my favourite sushi place, The Sushi Shop, and we had ourselves a maki roll par-tay! 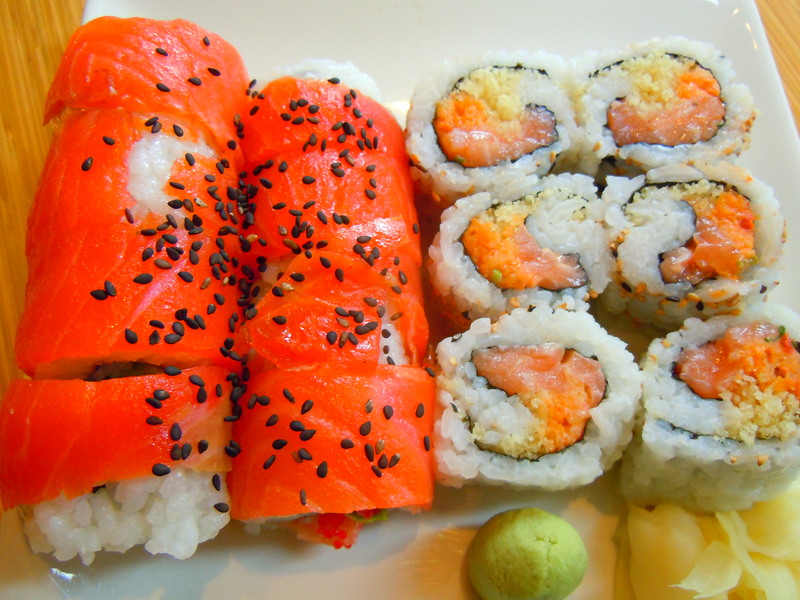 I recommended some of my favourites (the salmon with green onion as well as the smoked salmon, avocado, and cream cheese Vancouver rolls that I love so dearly!) and ordered some I hadn’t yet pigged out on (the spicy tuna, tempura, and avocado 911 rolls, and the Ebik maki with shrimp, tempura, avocado, and cucumber rolled in red masago). 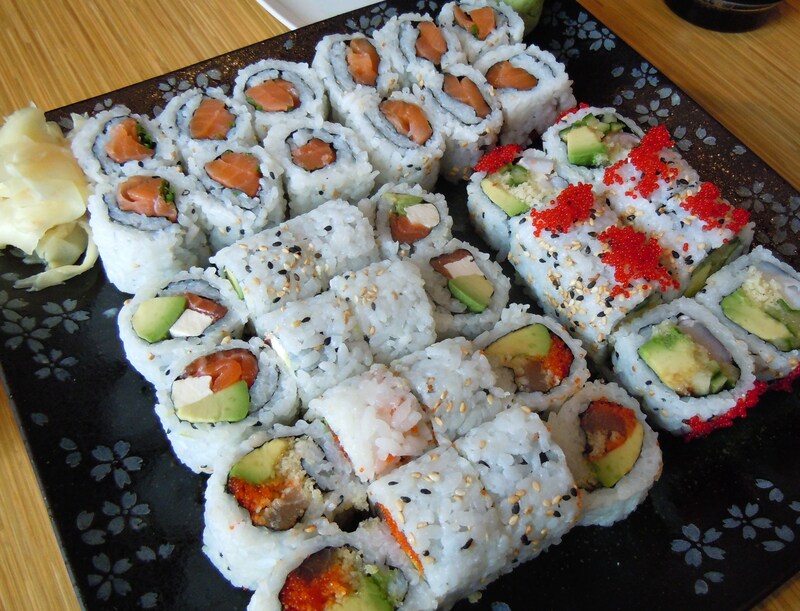 I loved it, they loved it, and we “mmmed” our way through a whole platter of amazing sushi rolls. This was a fun day, just for us. My dad isn’t into sushi rolls, so it worked out quite nicely. No guilt for going without him on our part! It’s something that we don’t get to do as often as we’d like. Our lives are hectic and we’re constantly pulled into different directions. My dad is work, my brother and I are both at school and have mountains of work to attend to, I’m not always home for dinner, and my mum runs the household and has a gazillion things on her never-ending to-do list. I know how hard-working my brother is and I know how he doesn’t get to do a lot of “fun” things during the school year, so it was important to me to make sure he had one super fun day during his week off. Call it sisterly love. We love sushi and my mum and brother love going downtown with me, so it was win-win for everyone. The Sushi Shop is located at the intersection of Yonge and Carlton St. (3 Carlton St.), with 2 other take-out locations serving the downtown core, one being in the GO train station concourse and the other near Maple Leaf Square at 25 York St (closed Saturday and Sunday). According to Google map, there is also a location on Bloor St. E at 175 Bloor St.E (Saturday and Sunday closed as well). 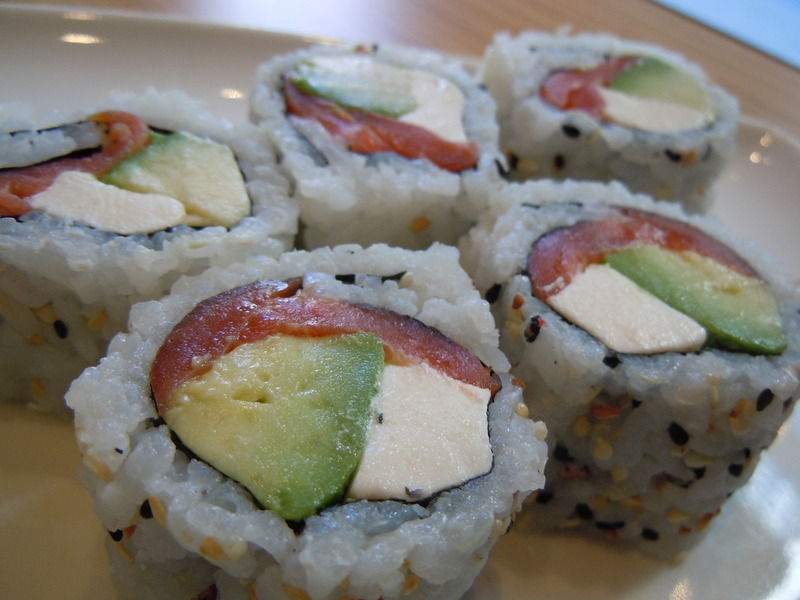 If you’re a cream cheese fanatic like I am, The Sushi Shop is PERFECT for you! 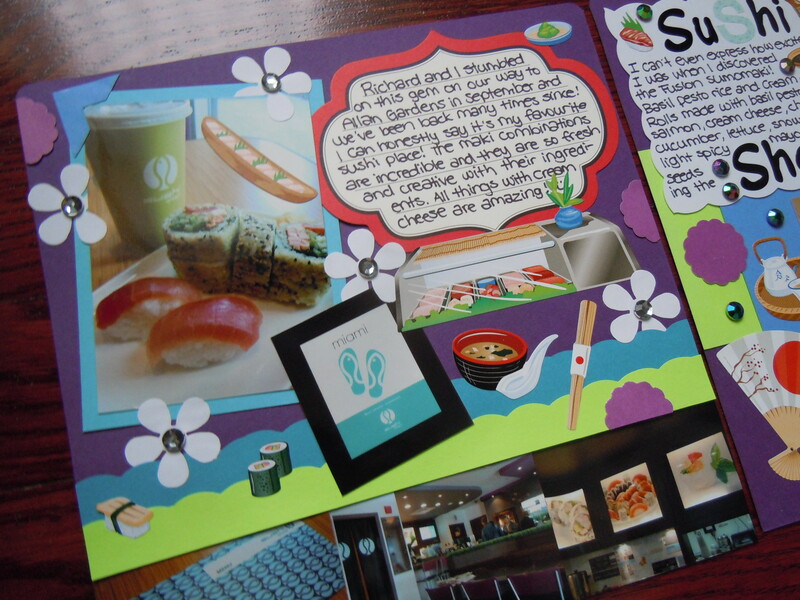 Not only is most of the menu dedicated to maki rolls and its variants (think square and rectangle sushi! 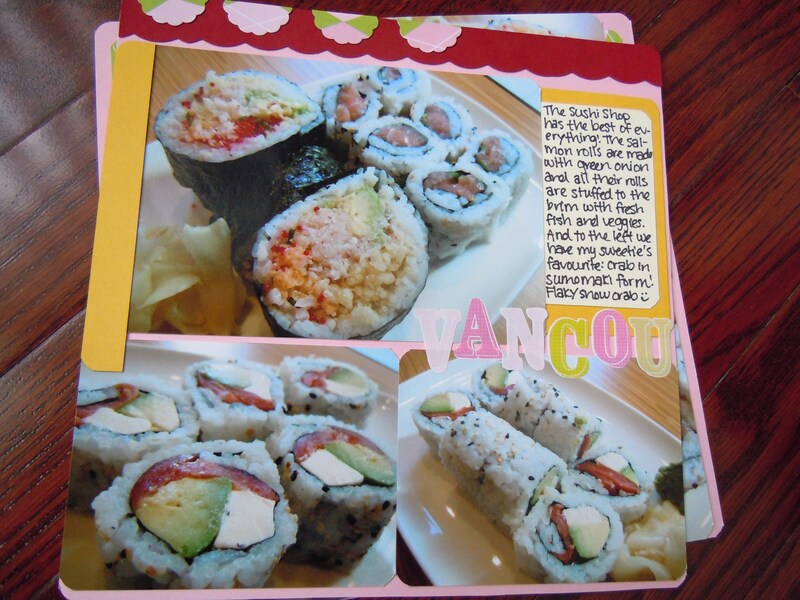 ), there are plenty of options for the cream cheese lover 😀 One of my absolute favourite combinations is salmon, avocado, and cream cheese (or just salmon and avocado in general) and The Sushi Shop offers an amazing roll called the Vancouver Roll (in a set of eight) with delicious thinly sliced smoked salmon (not to be confused with regular salmon sashimi – smoked salmon has that great slightly salty, cured flavour to it), avocado, and light cream cheese. You all know how much I love this place and there are so many reasons why. Their selection of cream cheese varieties is just one of them! 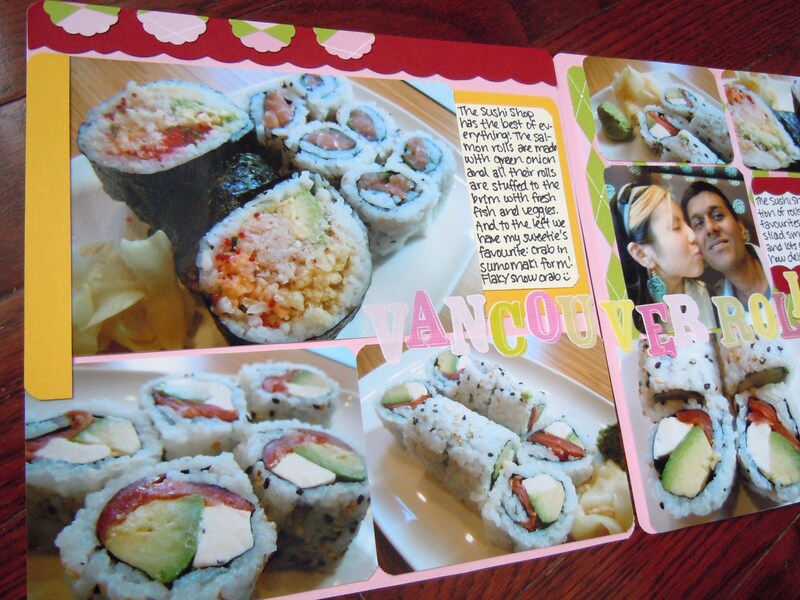 The Vancouver roll is served in 2 ways on the menu. 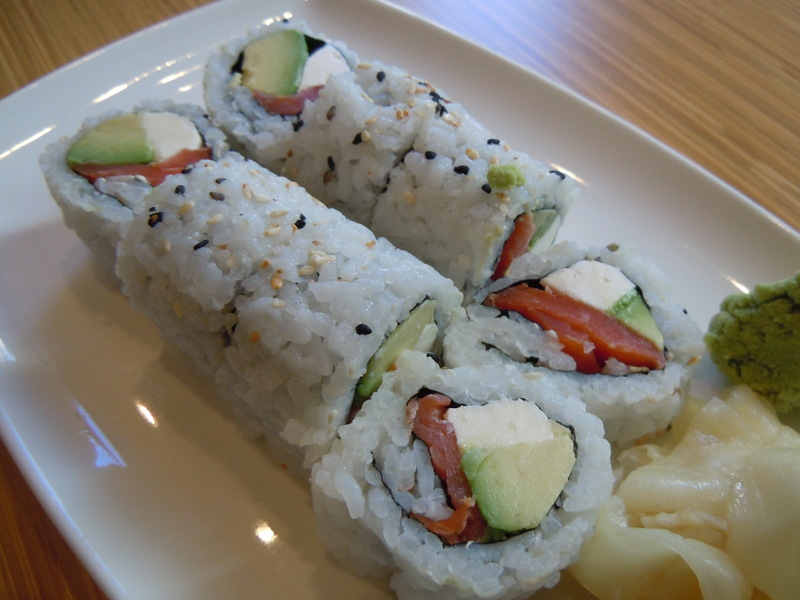 You can either order a set of 8 medium sized rolls for $5.95, or you can order the Express Lunch combo G (served from 11am to closing) which includes 12 medium maki rolls, 4 of which are the Vancouver roll. 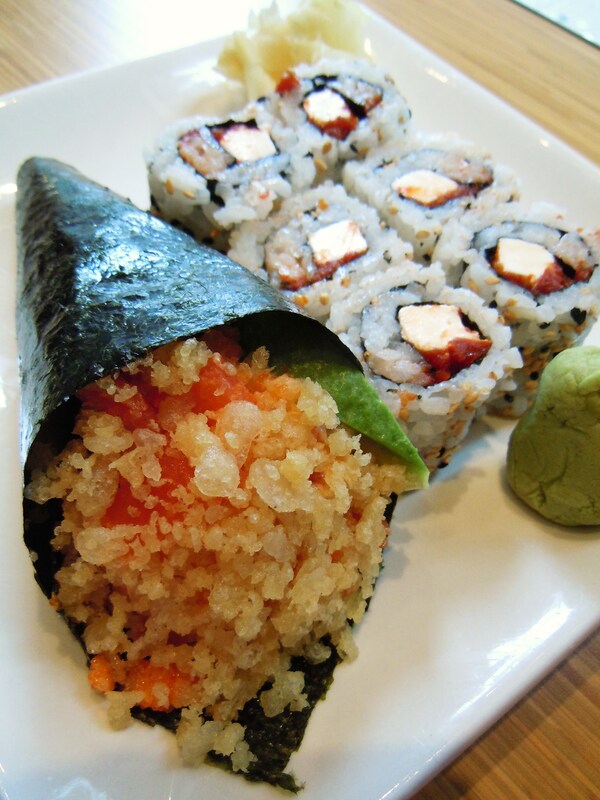 The sumomaki roll varieties can also be ordered as a hand roll, so there’s a few extra options there as well. YAY! If you’ve been following the blog, you’ve seen my scrapbook layouts and I’ve made it easier now to peruse through them 😀 I’ve added every single post featuring a scrapbook layout since I’ve started this blog to the category “The Kitchen Table”, so if you’re a scrapbooker like me (or just like to look at pretty paper things), feel free to roam around in there! I take a lot of pride in my work and I’m really grateful to everyone who’s been reading and following the blog, it means a lot to me. It’s been so much fun sharing and creating new things for the blog and I love talking about lovely things like craft supplies and brands and paper and all that good stuff, so don’t be shy if you want to hit me up just to yak about scrapbooking. 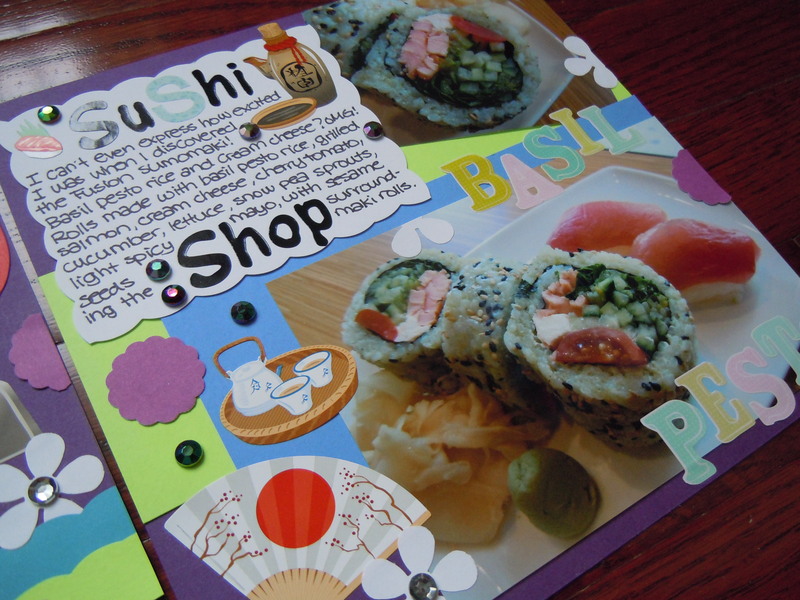 I just signed up for a Twitter account several days ago, so if you want to follow me, you can find me @AtebyAte; I would love to get to know other foodies and fellow scrapbookers! Scrapbooking materials used: baby pink, cherry red, and goldenrod yellow cardstock (Recollections); pink and green argyle patterned paper; alphabet stickers (K & Company); medium scallop circle paper punch (ek success); scalloped edge decorative scissors (Provo Craft). They were incredibly delicious. 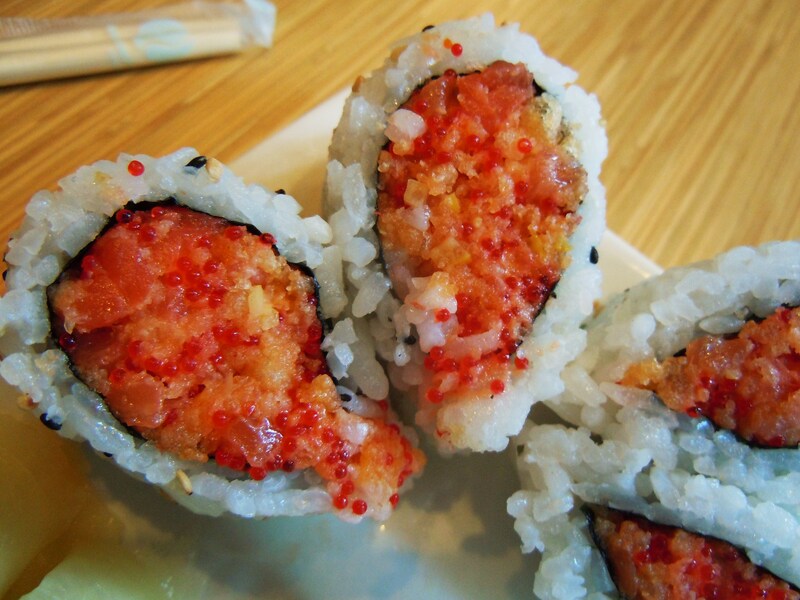 The sweetheart rolls were big and plump with a mish mash of spicy salmon woven into a smooth tempura crunch mixture with plenty of red fish roe. The texture was fabulous because the smoothness of the salmon meshed with the crunchiness of the tempura crumbles and fish roe into spicy, flavourful mouthfuls of happiness. 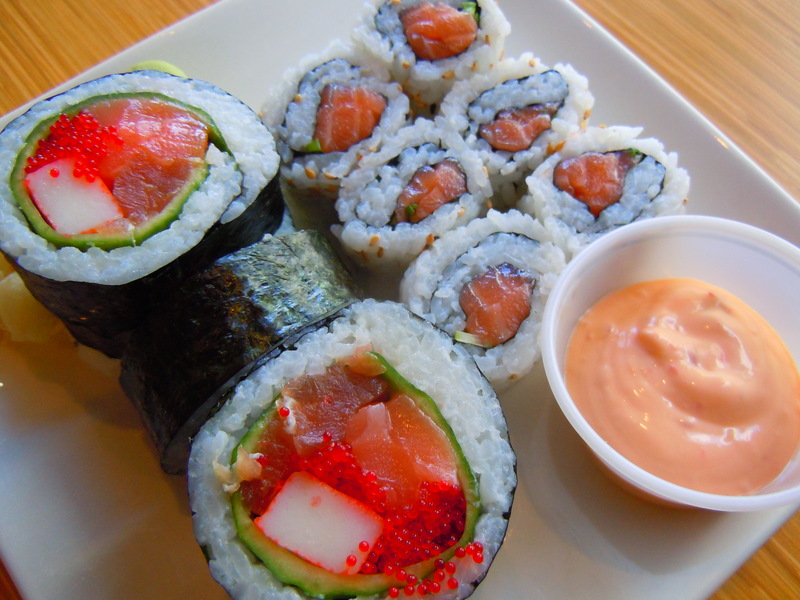 It’s a wonderful, thought out combination that I really love and I think the way the salmon and tempura is mixed and the spiciness is what makes these rolls a hit. As one of the sushi chefs said, “Kind of like love…you get a bit of everything!” So true and so clever; the rolls had a little bit of everything rolled into one. You have that fiery spiciness (passion), the crunch (stuff you have to work at), and the aesthetic sweetness of romance and love. My sweetie ordered the Boston Sumomaki rolls and an order of chicken spring maki and everything was so vibrant and colourful and fresh! 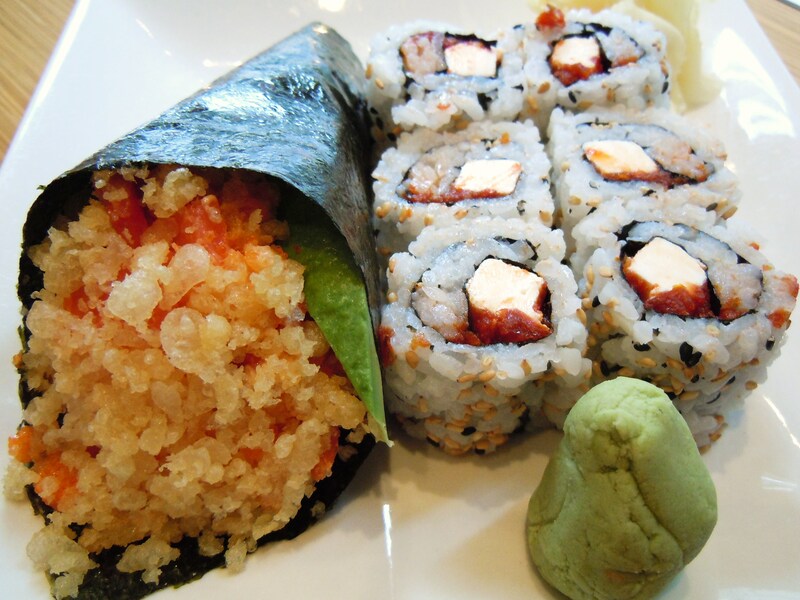 The Boston Sumomaki rolls remind me of a freshwater fish market with its large chunks of crab meat and shrimp with lettuce, matchstick cucumbers, light mayo, and plenty of red fish roe. 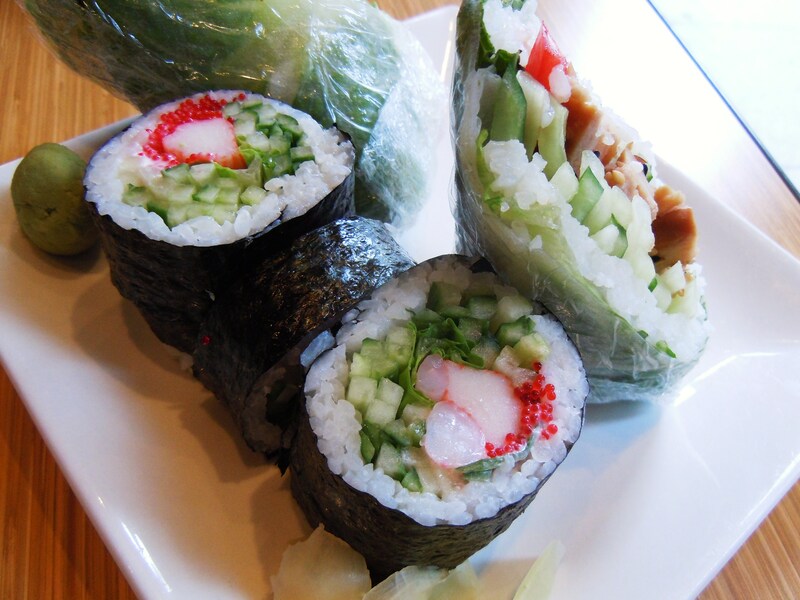 The spring maki are kind of like mini wraps with different types of meat, fish, and vegetables wrapped in rice paper. The chicken spring maki that my boyfriend ordered has a mixture of lettuce, cucumber, chicken breast, red bell pepper, rice, and sesame. 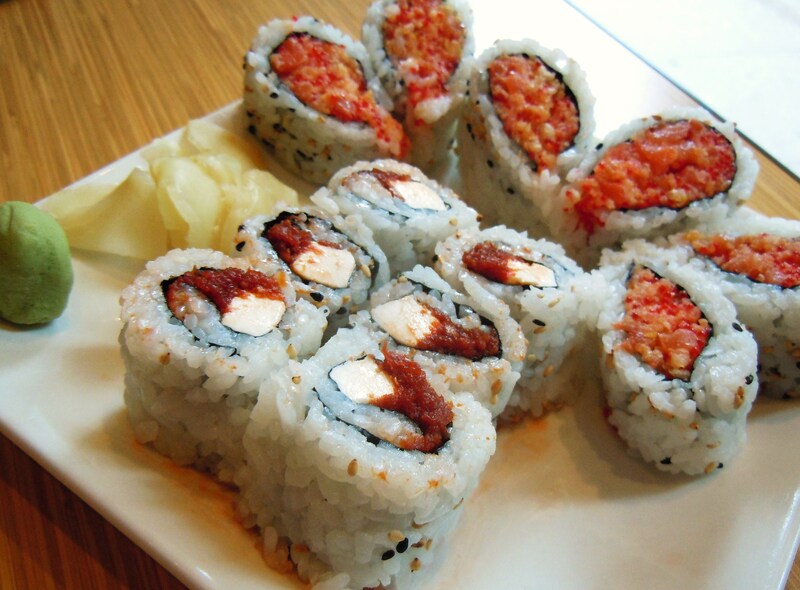 As for myself, to go with my sweetheart rolls, I ordered one of my favourites: the Akanasu, rolls of sundried tomato and cream cheese. ABSOLUTE YUM. 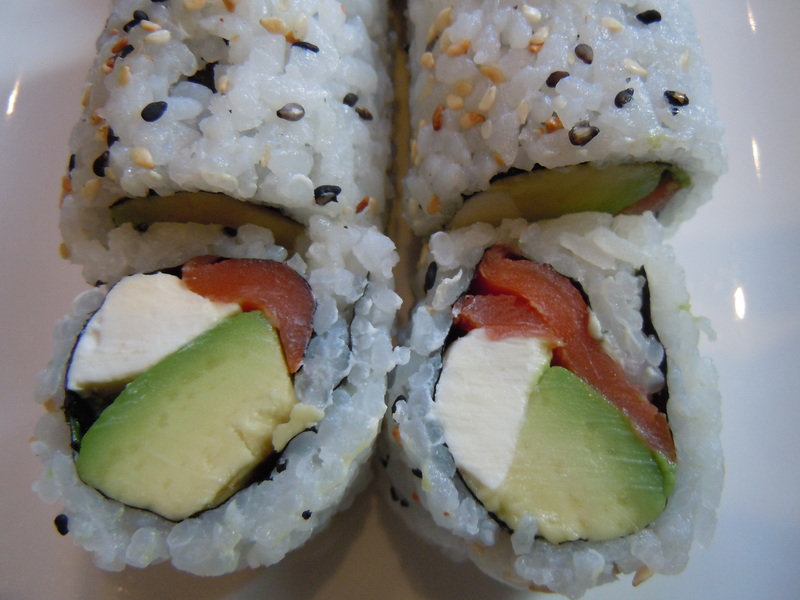 Cream cheese is in my top 10 list of foodie things that make my heart go boom-boom, and combine that sushi and you have yourself a very happy Deb! The cream cheese is plentiful and it’s deliciously creamy and tangy, and the sundried tomato has a hint of heat to it with that great taste of cured saltiness. The flavour is VERY punchy and the cream cheese mellows out the strong sundried tomato flavour. 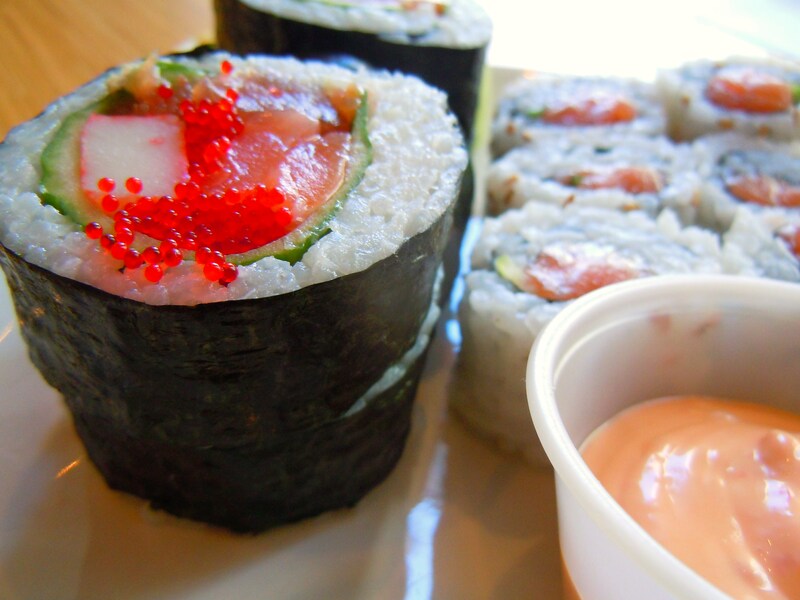 Forget bagels and cream cheese; cream cheese and sushi is where it’s at! I want to switch things up a little right now and tell you all a story about why this past Valentine’s was so special and heart-warming for me. I absolutely loved the food and goodies, but there’s more. My boyfriend and I visit our favourite garden in the city several times a year. 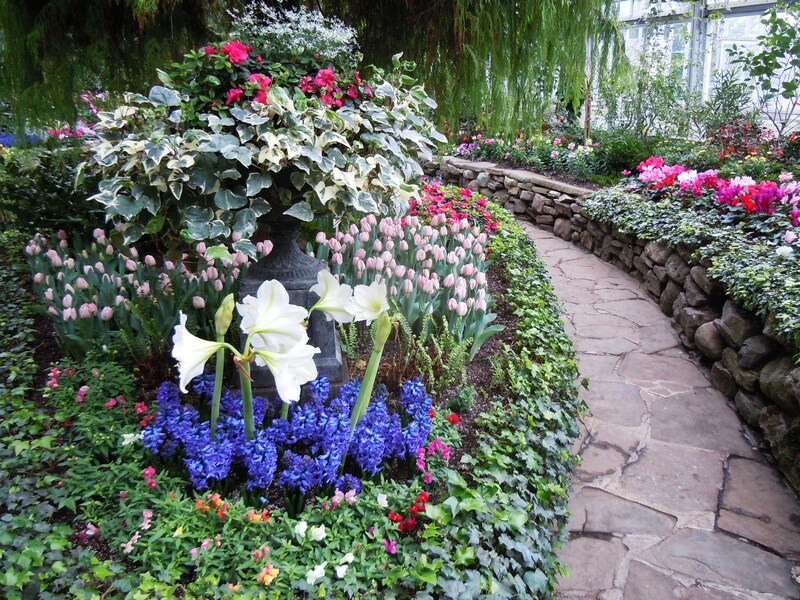 It’s an indoor conservatory garden called Allan Gardens, and it’s so beautiful and breathtaking. We go several times a year because the flowers and plants change seasonally and my boyfriend and I love taking pictures. We go snap happy! One of the things we love is taking photos of different gardens and parks around the city (as well as artistic graffiti) and Allan Gardens holds an extra place in our heart because it’s where Richard took me on our first date. Aww. 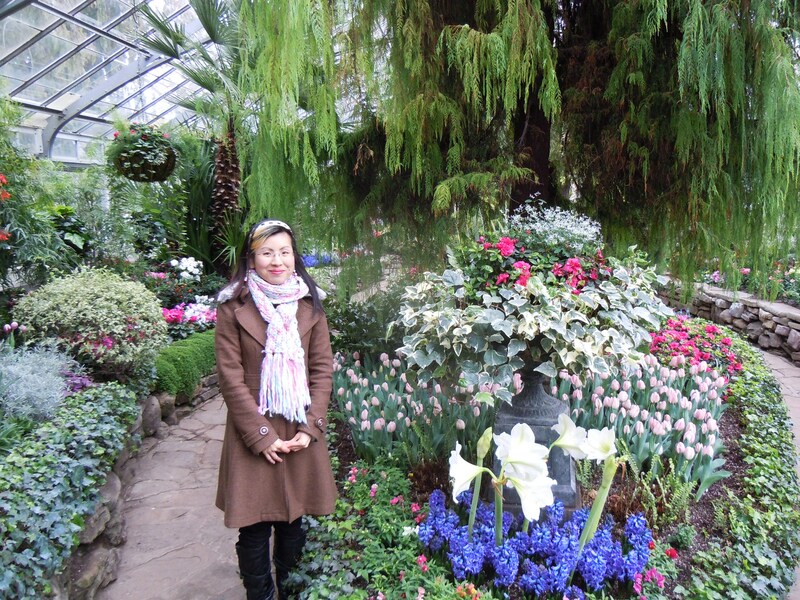 We hadn’t been to Allan Gardens during the month of Febrary before, so I thought it’d be wonderful to go on Valentine’s Day. Beautiful flowers, sprinkling water fountains, and quiet time with the boy? Doesn’t get any sweeter than that. 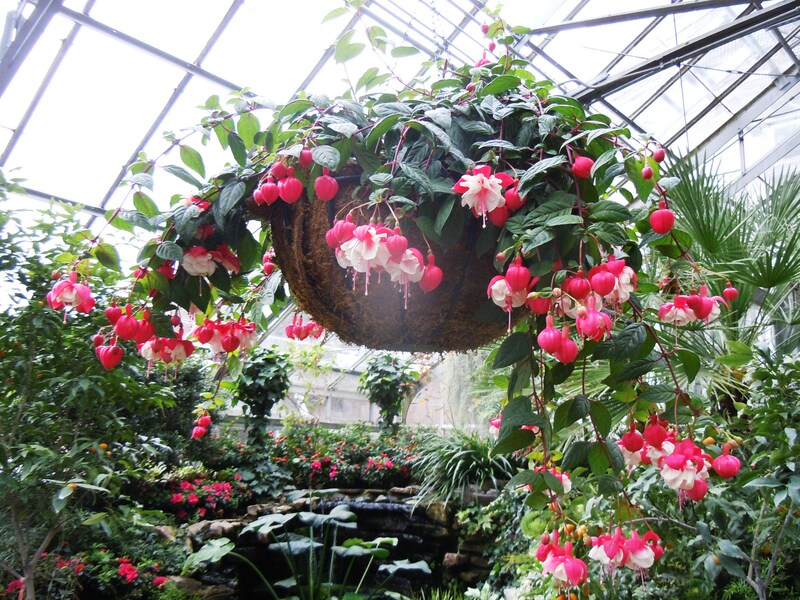 The conservatory is split into 4 different areas, each with different plants and flowers and as I walked into the section with the ever-changing seasonal petals, I did what I always do: gasp and squeal at how beautiful everything was. 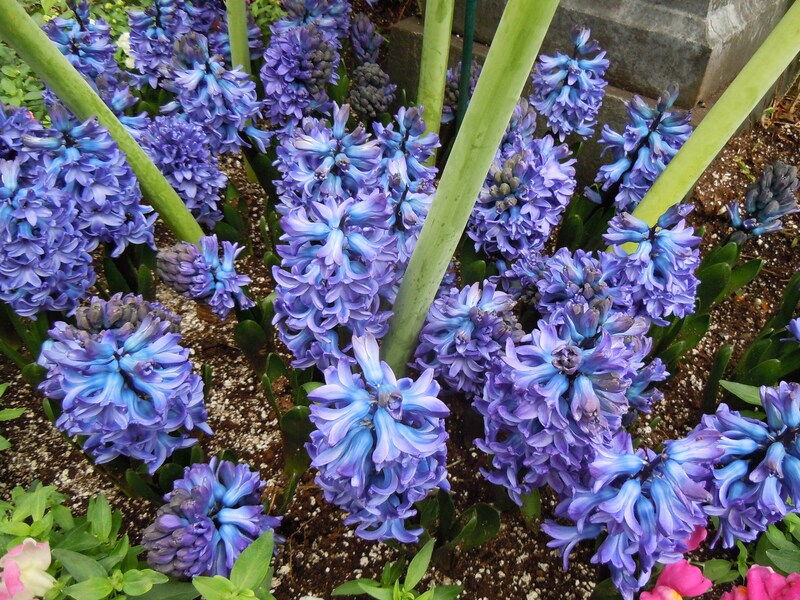 I was greeted with tulips, snapdragons, Easter lilies, and fragrant hyacinths and I skipped along identifying all the flowers I knew and learned about from all those years working in a flower shop, and I was just delighted. As we were clicking away with our cameras and admiring all the prettiness, we saw an elderly couple and asked if they could help us take a picture. The husband took our photo and the husband and wife, Bill and Mary, began talking to us about photography and flowers and gardens, and we stood there talking with them, sharing photos and sharing stories. Mary smiled at us, looking at Richard and I knowingly, like she somehow knew just by looking at us, how much we loved each other. It was Valentine’s and we were all there enjoying everything beautiful life had to offer, quietly, peacefully. Bill then took out a small photo album from his coat and showed us photos he had taken this past Christmas at Allan Gardens and I “awwed” at the sweet photos, lamenting that I had missed going this past year. I had gone during Christmas 2 years ago, but not the past holiday and there were new and different things I had missed. He then did the sweetest thing. He took the photo out of the album sleeve, handed it to me and said, “here, this is for you”. I get teary-eyed just thinking about it because it was such a sweet gesture. My heart felt so full and it still does. All I could think was, “they get it”. They understood. They understood, within minutes of speaking to me, how important pictures were and are to me in my life, how much I loved documenting memories. As we went on our way, Mary touched my hand and wished me, “happy valentine’s day”. Strangers come in and out of your life at the drop of a hat. But Bill and Mary came into mine as sweet and wonderful people, and this memory will stay with me forever. When I eat at sushi places, it’s kind of like playing a mental game of Where’s Waldo. I’ll scan the menu, mentally discard the options that I don’t care for (those who clearly don’t look like Waldo), take mental notes of the ones I might be interested in and remind myself to go back to them to reconsider (the areas that are really busy and confusing that need greater attention a bit later if I don’t find Waldo after the first go-around), and the kinds that make me squeal with excitement and convince me via words and/or pictures that I NEED to try this. 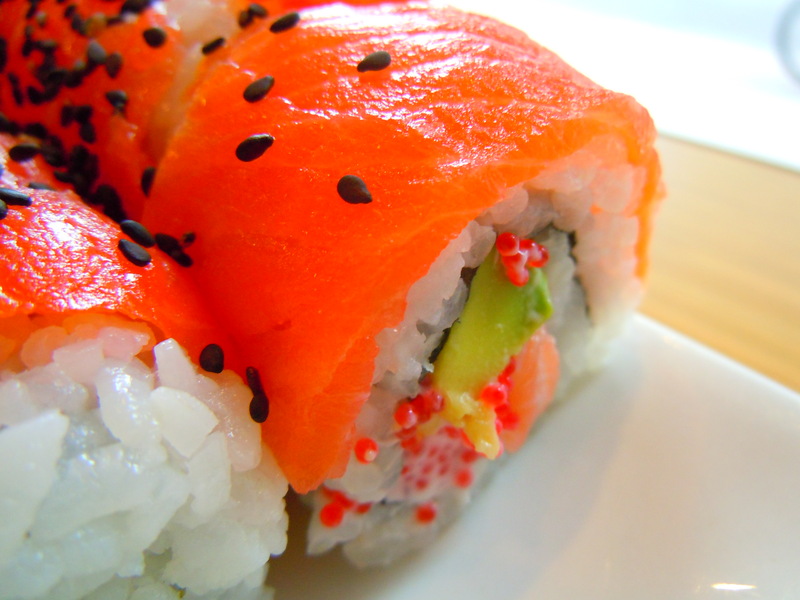 Cue the sushi radar alarm: Ding-ding-ding, meep-meep-meep, Waldo has been spotted! No further searching necessary 😀 That is certainly what happened my first time eating at Sushi Shop; my sushi radar was on overload! 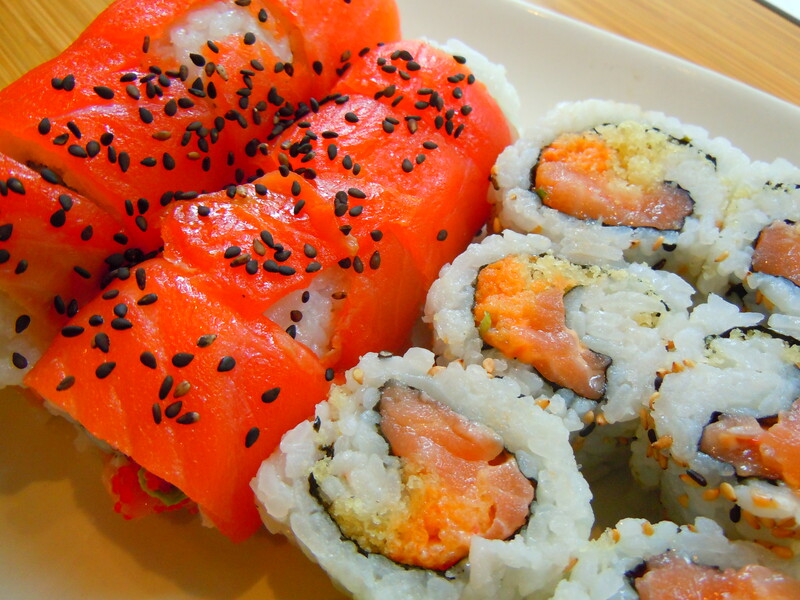 So many rolls that encompassed my two sushi weaknesses all rolled into one: salmon and cream cheese! 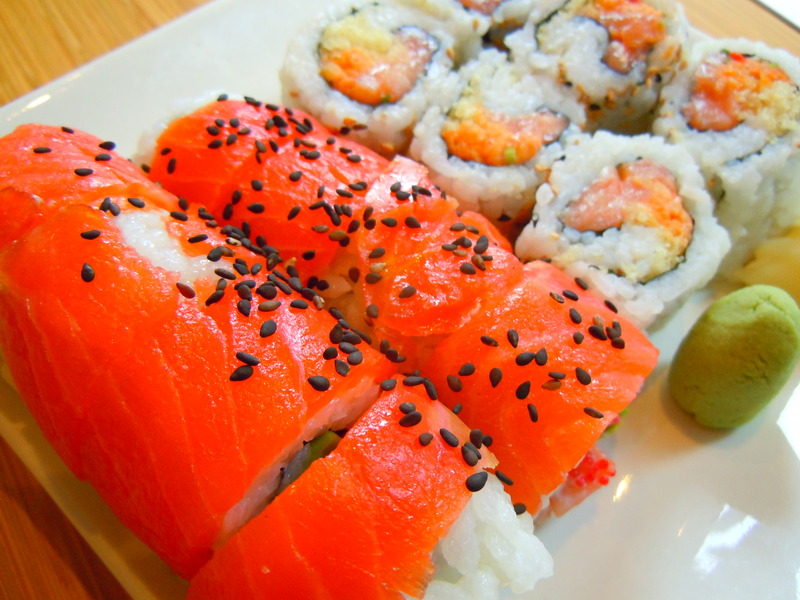 I love trying different things at sushi places, but those are the two things I can never resist. I love cream cheese so much, and I’m also a sucker for things like pesto and sundried-tomato, so the Akanasu rolls (a set of 6) with creamy, tangy light cream cheese, sundried-tomato, and sesame seeds, were a total no-brainer for me. 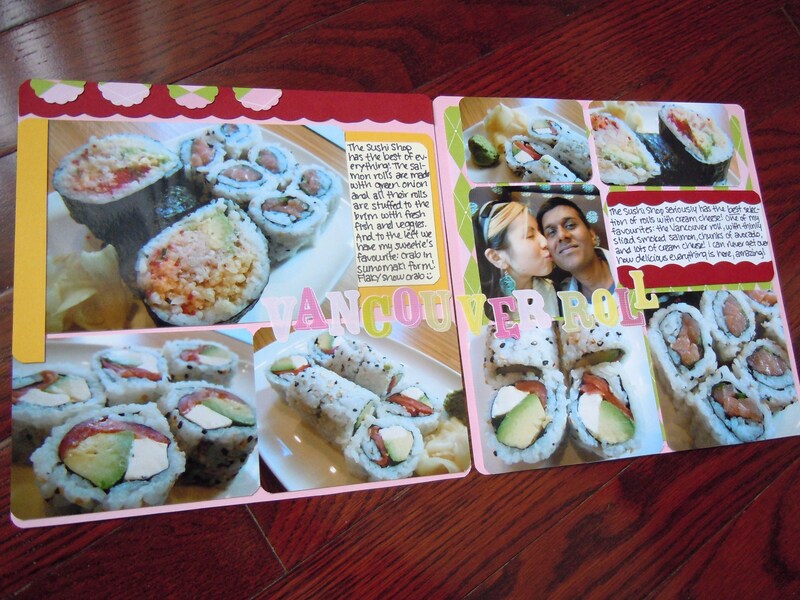 It’s like this sushi bar and I were meant to be! And all the Sumomaki rolls (sets of 5 large rolls) are also offered as hand roll varieties so I salivated a la Homer Simpson style at the description of the Smoky: fresh salmon sashimi, thick slices of avocado, orange masago (fish roe), spicy light mayo and sauce, and a huge truckload dumping of crunchy tempura, all wrapped up in sushi rice and seaweed. Hand rolls are fun because 1) who doesn’t like food you can eat with your hands?? 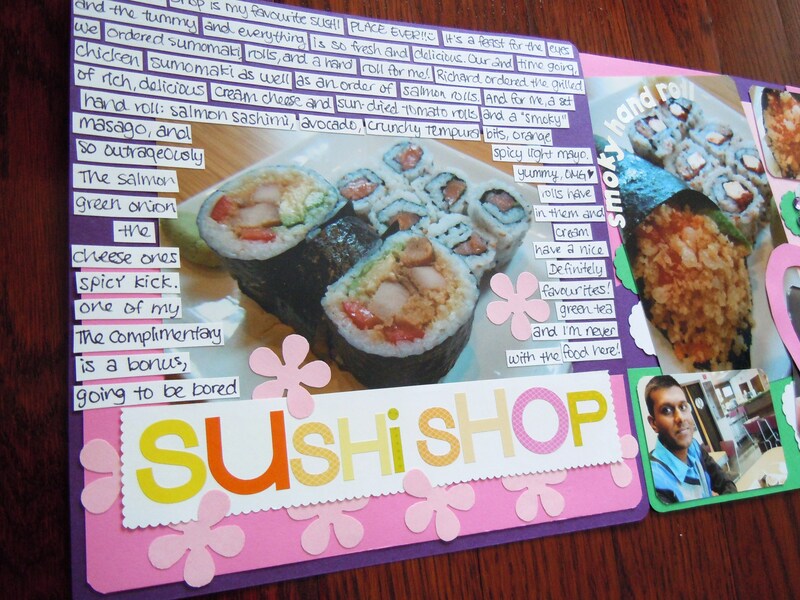 and 2) it’s like a sushi taco or burrito, woohoo! 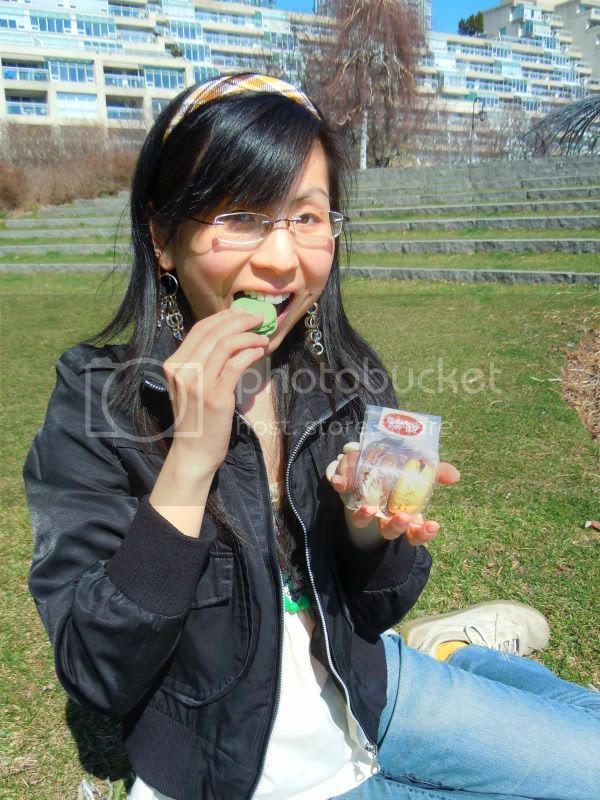 Every mouthful is pure deliciousness. Scrapbook materials used: purple, bubblegum pink, pale pink, and emerald green cardstock (Recollections); white paper; patterned alphabet stickers (K&Company); silver alphabet stickers (Sticko); magenta, pink, and purple adhesive gems; flower paper punch; medium scallop circle paper punch (ek success); black Sharpie felt tip marker. Have you ever been to a place and automatically, the moment you stepped inside, you felt as though you happened upon an absolute gem? This is how I felt when Richard and I first stumbled upon The Sushi Shop on one of our treks to Allan Gardens during this past September. Located right at the intersection of Yonge and Carlton St. (the eastbound neighbour to College St.), I literally did a double take when we passed by the window of the shop where posters of colourful sushi rolls met my gaze with cute names like Miami, Inferno, and Vancouver. Call me a sucker for downright good advertising, but right then and there, I knew this place was the place to be and one I felt utterly compelled to check out. And check out I did! With an adorable blue fishy logo and fresh green and purple decor, this sushi spot delivers the most amazing maki rolls you could ever imagine sinking your teeth into. Yes, that’s right, Deb has a favourite. Y’all know I’ve been to a number of sushi places over the years and this place, my friends, is my numero uno. 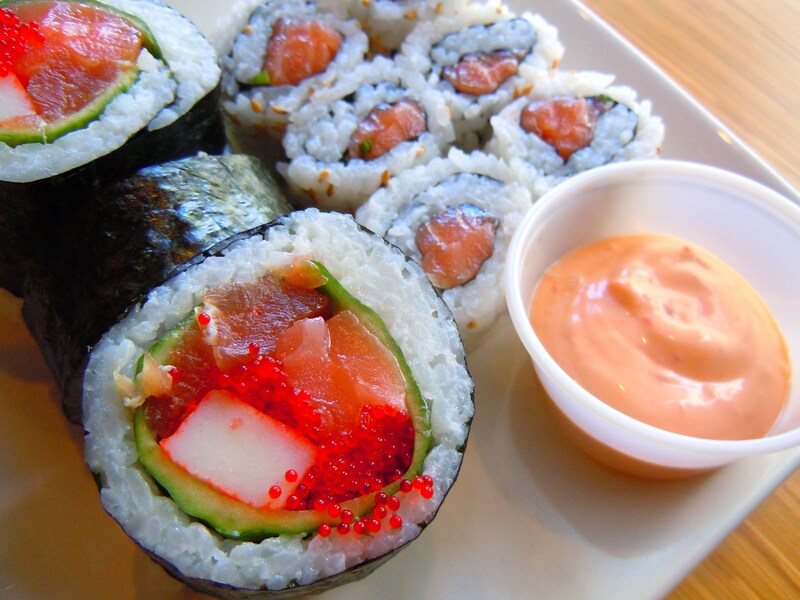 There are only 3 words to describe how delicious their rolls are: OH.MY.GOD. If you are crazy for rolls the way I am, I am telling you, THIS is your hot spot. The menu boasts over 30 kinds of maki combinations, along with nigiri sushi, rice paper spring rolls, fuji bowls, and other appetizers like shrimp tempura and edamame beans. Looking at the placemat sized menu was dizzying and exciting at the same time. If you’re eating out with me, probably frustrating as well as I am quite possibly the most indecisive person on the face of the earth. I whimper when I can’t decide on what I want because I want everything (cue frantic flipping of menu pages and whiplash head movements back and forth). True story. Not only are they unique in specializing in maki, but they’re also all sorts of special in how they serve their portions. We’re accustomed to seeing servings of rolls in denominations of 6 or 8 and although they have many to choose from in those two amounts, they have a HUGE selection of what is referred to as sumomaki: 5 extra large rolls in mouthwatering combinations such as snow crab, smoky salmon, and sun-dried tomato pesto, just to name a few. 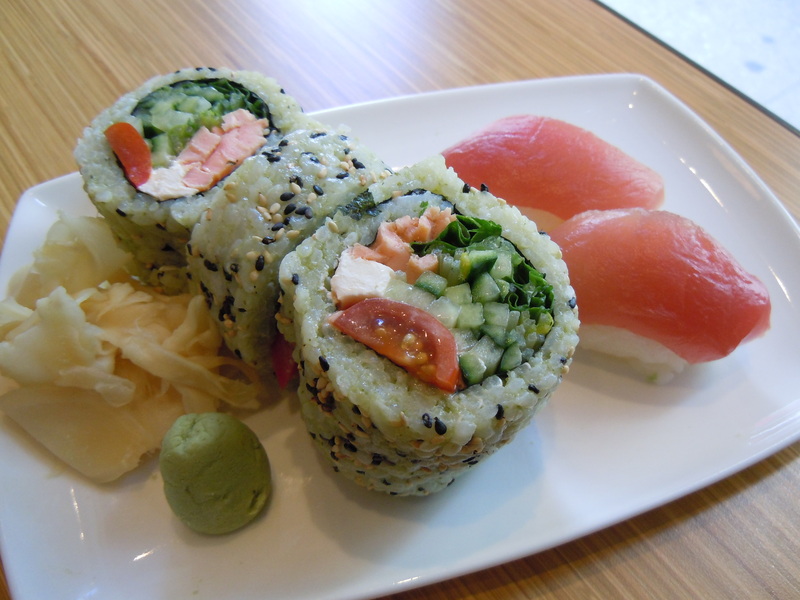 You can think of sumomaki as 10 regular-sized rolls as each sumomaki roll is equivalent to two. These are honking amazing. My heart almost leapt in my throat when my eyes fell on the Fusion sumomaki roll: rolls with grilled salmon, basil pesto rice sprinkled with sesame seeds, cream cheese, cherry tomatoes, cucumber, lettuce, and snow pea sprouts (cue Deb breathing into a paper bag). You don’t understand. I love basil pesto. And I love cream cheese. If you will recall from my list of 7 Secrets, I will eat cream cheese by the spoonful. 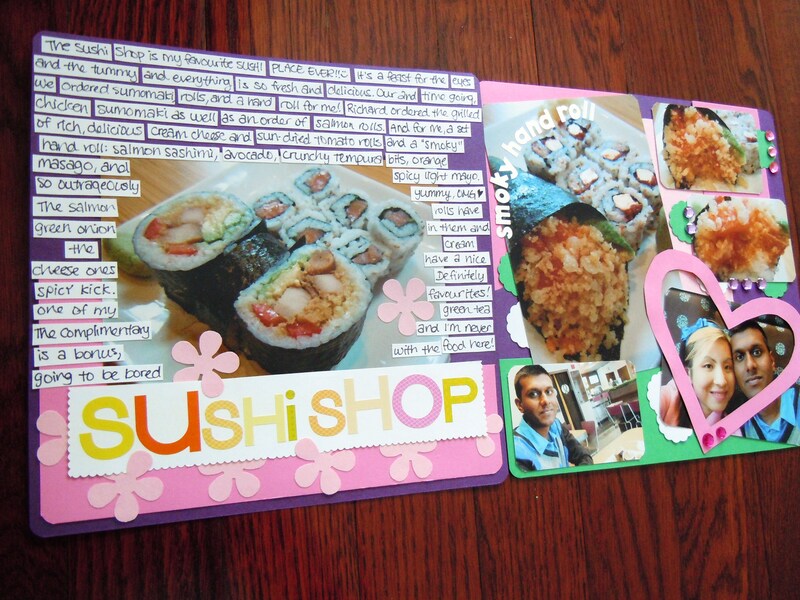 So to find sushi that encompasses BOTH? Well, it certainly doesn’t take a rocket scientist to figure this one out! Green tea is complimentary with your meal. I cannot sing enough praises about The Sushi Shop. The quality of ingredients and artistry is just second to none. You instinctively know when you taste and eat something that it is truly above and beyond. Richard and I have been back a number of times and each time has been fantastic. Not one time have we ever been disappointed and not just with the food, but with the service. Remember how I said at the beginning of the post, that this place was a gem? I was referring not just to the food, but to the people who work here. The guys who make the sushi and run the shop are so very nice and they truly appreciate their customers. They take the utmost care in delivering quality to your plate and with every ding of the bell at the front entrance and exit, you know that people who come here are happy and they have been great to us. Having worked in the retail and service industry for 4 years, I know the trials and tribulations that come along with the territory. Respect is reciprocal. It is neither owed nor granted automatically. And it warms my heart knowing that the appreciation for food and good service, as well as hard work, are at the top here. After paying for my meal, one of the sushi chefs looked at me and asked if I spoke Cantonese. I responded yes. He then proceded to converse with me in Cantonese, talking about living and working in Toronto and I shyly spoke to him, telling him how much I enjoyed the food. He struck up a conversation with Richard (in English, mind you) and it was a great moment. A moment where you knew a common ground had been laid, and a relationship and rapport had been built. I loved their food and they were grateful for my patronage. Each time I go, I thank them and they wave goodbye and thank me in Cantonese as I walk out the door. I smile and think, “nah, with food this good, the pleasure is all mine”.